Disasters don’t just sit around and wait for you to plan for them. Disasters such as floods and hurricanes can strike at any time, and the damages can be devastating. Learning how to prepare for disasters is not only a potentially life-saving skill but can also help you stay ahead of the curve in the business world. 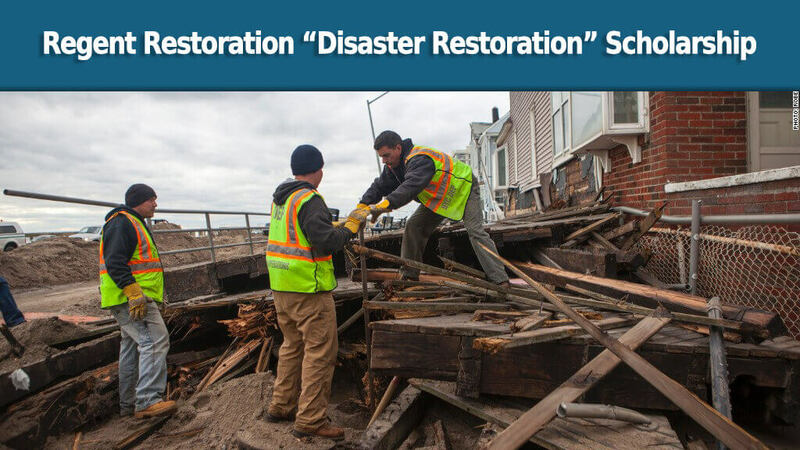 To help educate students about disaster preparedness, Regent Restoration is proud to offer the "Regent Restoration Disaster Relief Scholarship". The winner will receive $500 dollars and we will donate $250 dollars to the Direct Relief Fund, an organization that helps victims rebuild their lives after natural disasters strike. In light of the recent hurricanes that have been striking the U.S., what’s the best way to prepare for a hurricane and what should you do after the storm passes to remain safe? The Regent Restoration Disaster Relief Scholarship is open to both high school and college students who are at least 18 years of age. Applicant must be a U.S. citizen or permanent legal resident of the US. The applicant must submit his/her essay using a '.edu' email address. The winner will receive a one-time fund of $500. Funds are provided by Regent Restoration and will be made payable to the recipients PayPal account. The finalist will be selected after a team of judges reviews all entries. All entries must be received by April 1st, 2018, and the winner will be announced the same day. Applicants will be judged on the creativity, writing skill, and content of their submission.We will notify the winners by email and their essay will be featured on our website. If the applicant or the applicant’s parent/legal guardian or immediate relative is employed by Regent Restoration at the time of award, the student is no longer eligible and will forfeit the scholarship. Regent Restoration reserves the right to alter or discontinue this program at any time without notice. All entries become the property of Regent Restoration and may be reposted or reused, in whole or in part, in any medium. When ordering or registering on our site, as appropriate, you may be asked to enter your name, email address, phone number or other details to help you with your experience. We collect information from you when you fill out a form or enter information on our site. Regent Restoration is a water damage restoration company in Dallas that provides disaster cleanup and repair services to disaster-stricken areas. EmailMust be from .edu domain.